This tab is used for defining the employment details of the employee, and includes the working hours, Extra hours conditions, Shift Layout, Vacation/Sick days and irregular shifts. Hours per Shifts The hours per shift, as agreed with the employee. Amount of Extra 125% hours The amount of extra hours of 125% payment. Enable Extra 150% hours Define whether to allow extra hours of 150% payment. Everyday Break with NO payment (in minutes) If the employee does not get paid for the break time, fill in the daily break time. Suspended from Presence Log Define whether the user can the Attendance Clock of Hyper. Choose "NO" to allow the user to use the attendance clock. Entity Type This field displays the entity type of the user. Team Calendar Color Define a calendar color for this employee. Limit Meetings Number of Participants to In order to limit the number of participants in every meeting of this employee, fill in the maximal number of participants. In this table, define the permanent shifts of the employee. In the Personal Calendar and in the Team Calendar, these shifts time will be marked with white background. 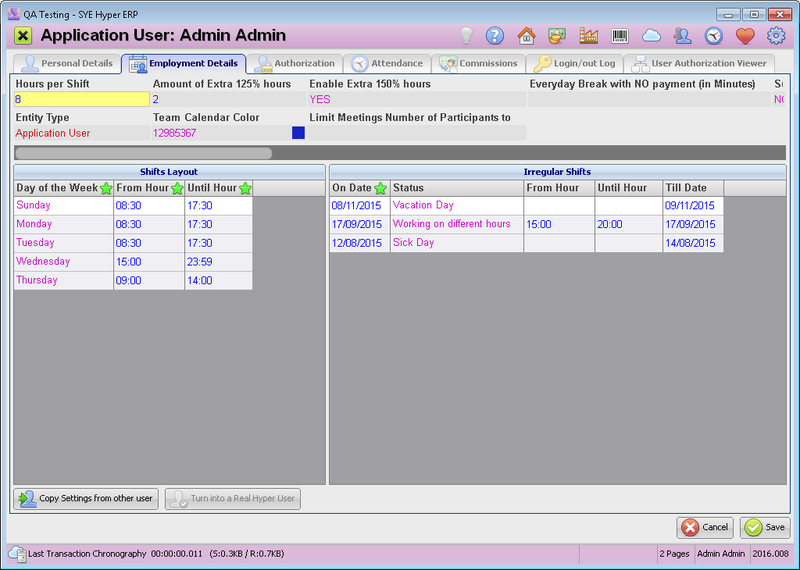 This will assist other users to set their meeting and arrange their schedule, according to this user's working time. In order to define the shifts, fill in the working hours for each day of the week. For each day, press Ctrl+Enter to add new row (or use the right click menu). Select the day of the week and the shifts hours (From Hour, Until Hour). Working on different hours - To update changes in the daily shift, select this option in the "Status" field and fill in the new hours. Vacation Day - In order to report vacation days, select this option and fill in the dates. Sick Day - In order to report a sick day, choose this option and select the dates (On Date, Till Date). To add a new row, press Ctrl+Enter or use the right click menu. Copy Settings from other user - Select a user card from the list, to copy its settings. Turn into a Real Hyper User - This button is available for employees that do not have an Hyper user. Hyper Authorization Select the required authorization group from the list. Hyper Password Fill in Login password for the user. Translation File Select the required language for the user's interface. After filling in these fields, this card will be turned into Hyper user. The "Authorization" and "Login/out Log" tabs, will become available.